Great news! Henry May’s blues guitar instrumental, Dreamin’ the Blues, is a semi-finalist in the 2016 International Songwritng Competition (ISC)! ISC is internationally renowned for its high-caliber judges, and with more than 16,000 entries overall, that’s a real coup! Congratulations, Henry!! Stay tuned!! Finalists will be announced within a couple of weeks, and winners will be announced once the judging process is completed. 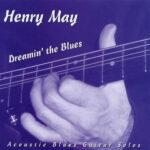 “Dreamin’ the Blues” is on Henry’s Swift River Music CD, Dreamin’ the Blues, produced by Andy May.